Emotional compatibility and the effectiveness of anti-drinking messages: a defensive processing perspective on shame and guilt. Journal of Marketing Research: 2010, 47(2), p. 263–273. Unable to obtain a copy by clicking title? Try asking the author for a reprint by adapting this prepared e-mail or by writing to Dr Agrawal at nidhi-agrawal@kellogg.northwestern.edu. You could also try this alternative source. US students already burdened by these emotions reacted to shame or guilt-inducing anti-drink ads by intending to and actually drinking more, the opposite of what was intended. This intriguing series of studies may reinforce the feeling that the ways anti-substance use ads can backfire are so various, the safest option is not to try them. Summary This series of US studies using university students as subjects explored how people already experiencing or prone to shame or guilt respond to anti-alcohol adverts which induce the same unpleasant emotion. Unlike other aversive emotions, shame and guilt involve a conscious and negative perception of oneself as being seen to violate social norms and one's ideal self (shame), or having unacceptably caused harm to others (guilt). Especially if already feeling bad about oneself in these ways, people may guard against and resist information (eg, 'That won't happen to me') which would otherwise aggravate these uncomfortable feelings. The result could be to negate and even reverse the intended impacts of adverts which arouse these emotions. A case in point might be ads warning that the consequences of one's over-drinking may be witnessed by friends and family (shame-inducing) or cause them serious inconvenience or harm (guilt-inducing). To investigate this theory, in a pilot study an ad from a public service responsible-drinking campaign was modified to convey either shame or guilt due to the impact on "those you love" of a drink-laced "Best night of my life" illustrations. By random allocation, one or other ad or none were shown to 75 students, who then rated the degree to which they were feeling guilt or shame. As expected, the shame-inducing ad did lead to the greatest feelings of shame, while the guilt-inducing ad led to the greatest feelings of guilt. Having established that the ads aroused the intended emotions, the researchers then investigated this effect's impact on how students responded to the ads, in particular their intended or actual drinking. Study 1 randomly allocated 478 students to describe in writing an episode during which they had experienced either extreme shame or extreme guilt, or to simply describe their typical day. Again ratings indicated that the intended emotions had been aroused. Then the students were asked to evaluate either the shame-inducing anti-drinking ad or the guilt-inducing version. After a break they then completed a survey of the "habits of college students" which included the question, "Compared to last year, how often do you plan to binge drink this year?" A similar question asked their views about the intentions of the average student. Students primed by the first task to feel shame, and then shown an advert inducing the same emotion, planned to binge significantly more often than the other students, including shame-primed students shown a guilt-inducing ad. The pattern was the same for the guilt variants of the preceding task and the ad. In contrast when, the individual was no longer themselves 'threatened' by the question, the combination of shame-inducing task and ad led them to make the lowest estimate of how often other students would binge-drink. In other words, it was not the ads' induction of negative emotions as such which generated a counterproductive impact on drinking intentions, but the 'piling on' of the same unpleasant emotion previously aroused, and then only when the viewer's own drinking was at issue. The process of defending themselves from yet further shame (or further guilt) seemed to lead the students to reject the ad's message, so that compared to seeing another ad, they planned to drink more. The opposing impacts on their ratings of their own versus other students' intentions proves they had not simply 'switched off' in response to the ads – they were switched on and processing the messages, but not as the ads' developers might have wished. Study 2 extended the findings of study 1 from intentions to actual drinking. It recruited 71 students and followed a similar procedure to study 1 – a shame- or guilt-arousing recall task followed by viewing the shame- or guilt-arousing ad. Then the students were asked to evaluate the ad, and after a break, told they would be sampling and rating a new alcoholic drink mixer, of which they could drink as much they wanted. Among other questions, they were then asked to rate how likely they would be to shame themselves (or for students assigned to the guilt-arousing task, do something they felt guilty about) after having had a couple of drinks at a party, an attempt to assess whether they really had been provoked by the ads in to being defensive about their drinking. When a shame- or guilt-inducing ad followed a task intended to arouse the same emotion, students drank more than when task and ad had been intended to arouse different emotions. They also saw themselves as less likely to get in to a situation causing the same feelings after drinking at a party. It seemed that piling on the same negative emotion led them to deny the link between their drinking and possibly behaving in ways which cause shame or guilt, a defensive posture which led them to actually drink more than if these emotions had not been serially provoked. Unlike the previous studies, study 3 used ads to prime shame or guilt, more like what might happen in real life. The first ads shown to 182 students were unrelated to alcohol, but explicitly sought to generate shame about cheating, or guilt about the environmental consequences of buying bottled water. A test confirmed the intended effects. Then they were shown one of the two anti-drinking ads, and after a break asked to rate the likelihood that during the next two weeks they would patronise a bar, or consume three or more drinks in one evening. Combining these answers created a single measure of drinking intentions. As expected, when a shame-inducing anti-drink ad followed another shame-inducing ad, students expressed firmer intentions to go out and drink heavily, but not because they had ignored the anti-drink ad – in fact, they recalled the ad better than the other students. Moreover, even though they had serially been exposed to shame-inducing ads, these students felt less shame at the end than other students in the study (but not less guilt). Similarly for the guilt-inducing ads. This pattern was consistent with the students successfully resisting the alcohol ads' attempts to generate yet more of the same uncomfortable emotion already generated by the preceding ad, and as a result also resisting its anti-drink message. The assumption was that students exposed to the shame-inducing adverts ended up feeling less shame than before, and similarly with guilt – but with no pre-ad measures of shame and guilt, this was just an assumption which fit the evidence. Study 4 rectified this by replicating study 1 with another 64 students, but this time taking before-and-after measures of guilt and shame. As before, first the students described a shame or guilt-inducing incident from their lives. This time they were then asked to rate their feelings of shame and guilt, measures repeated after they later watched one of the two anti-alcohol adverts. When the advert was intended to arouse the same emotion as the preceding task, the opposite happened – feelings of that emotion actually fell from before to after watching the ad, relative to watching one intended to arouse a different emotion. In contrast, students primed to feel shame did feel more guilt after seeing the guilt-inducing ad. When processed defensively by people already burdened by these emotions, it seemed that a message designed to induce shame or guilt actually reduced the intended emotion. The preceding studies had 'artificially' induced feelings of guilt or shame before exposing students to the anti-alcohol ads. Study 5 instead investigated the effects of the ads on people naturally prone to feel either guilt or shame. A questionnaire was used to assess these propensities among 233 students, who after a break were then shown one of the two anti-alcohol adverts. As in study 1, they were then asked, "Compared to last year, how often do you plan to binge drink this year?" The results were similar to the other studies. Shame-prone students were more likely to plan to drink heavily more often if they had been shown the shame-inducing advert, but not the other. For guilt-prone students there was a corresponding finding. In relation to 'irresponsible' drinking, these studies show that when emotions which entail an uncomfortable perception of oneself are further stimulated in ways which threaten to heighten this discomfort, viewers tend to convince themselves that the message does not apply to them ('defensive' processing), leaving them freer to do what the message warned against than if it had never been received. In particular, shame-laden consumers exposed to messages which asserted that drinking might lead to additional shame-inducing situations, believed that their own drinking would not lead to those consequences, and similarly for guilt. In contrast, when there was no threat to the self and the viewer was asked to think about the behaviour of others, the warnings had the intended impacts. The findings also suggests that people 'repair' negative mood states not in general but in relation to the specific mood they are experiencing; shame-laden consumers resist messages that might lead to greater shame, but are open to messages that lead to guilt, and vice versa. In some of the studies effects were not large, but much larger in study 2 which assessed actual drinking, suggesting that guarding against the 'piling up' of negative emotions might strongly influence health-related behaviour. Public service health promotion messages often highlight how friends or others might see you if you behave in the way the ad is seeking to deter. In relation to binge drinking, commonly ads arouse concern over 'making a fool of oneself' or 'losing control and doing something bad'. Commonly these ads also highlight emotions which play on these concerns (eg, 'Avoid the shame and embarrassment of a drunk-driving arrest') and the consequences of one's actions on others (eg, 'Think about those you may harm if you cause an accident while driving drunk'). The featured research suggests that emotional appeals such as these playing on guilt or shame should be used cautiously, and that attention should be paid to the broader milieu within which the ad will be embedded. For instance, a guilt-inducing message may not be optimal if inserted in a guilt-ridden television drama. 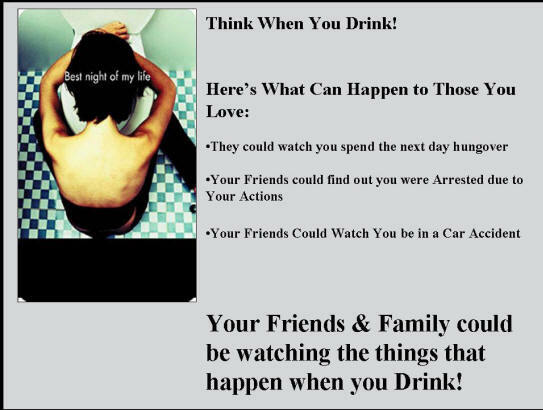 However, such appeals may work as intended if the viewer is directed to the behaviour of others rather than themselves, as for example in the popular public service message, 'Friends don't let friends drive drunk'. commentary This intriguing series of studies might well reinforce a feeling that the ways anti-substance use campaigns can backfire are so various, the safest option is not to mount them. Describing the implications of the findings, one of the featured article's authors warned that "public health and marketing communities expend considerable effort and capital on [anti- or 'responsible' drinking] campaigns but have long suspected they were less effective than hoped. But the situation is worse than wasted money or effort. These ads ultimately may do more harm than good because they have the potential to spur more of the behaviour they're trying to prevent." It can happen, he said, because "Advertisements are capable of bringing forth feelings so unpleasant that we're compelled to eliminate them by whatever means possible. This motivation is sufficiently strong to convince us we're immune to certain risks." The implication for health promoters was that "If you're going to communicate a frightening scenario, temper it with the idea that it's avoidable. It's best to use the carrot along with the stick." The mechanism the authors propose for this effect is distinct from the 'reactance' thought partly to underlie counterproductive reactions to the anti-drug messages of the US National Youth Anti-Drug Media Campaign. Seeing these ads, some young viewers may have resented being (as they saw it) 'told what to do', and reacted by moving in the opposite direction. Another way these ads may have backfired is by implying that drug use was so common and so hard to resist that the government had to warn young people about it. Ads which contradict personal experience may also be counter-productively discounted by viewers. Yet another mechanism is that ads can generate discussion between young people, which may be dominated by the more voluble risk-takers among them who tend to favour substance use. Another proposed mechanism is that ads which generate too much emotion lead recipients to 'shut down' and simply not process the message. One way to avoid these reactions is to end on a more positive note after presenting a warning, relieving the negative emotion and defusing defensiveness – found in a Spanish study to lead students to say they were less likely to drink excessively than a totally negative anti-drinking message or no message at all. For the authors of the featured article, none of these explanation account for their findings. Instead they deduce that the students did pay attention to and process the messages of the two anti-alcohol ads, but in such a way as to defensively divorce themselves (if not others) from the risks portrayed. If this, as they persuasively argue, was the case, it may however have been due to the situation. The students had 'signed up' (sometimes in return for course credits) to participate in a study which involved assessing the ads; they may not have considered themselves at liberty not to 'process' them – that the situation and their obligations demanded they do not simply ignore them. To avoid further unpleasant emotions, perhaps they were left with little option but the 'defensive processing' hypothesised by the researchers. In real-life situations, viewers normally can simply turn over the page, look the other way, or stop paying attention to the TV, reactions which might neutralise the ad's messages but not lead to counter-productive reactions. All the studies involved young people in the USA, who below the age of 21 are not permitted to legally buy alcohol and usually also forbidden to drink. All too were students, a group newly liberated from parental control and known to in some quarters value excessive drinking. Rather bluntly, in some of the studies they were asked "Compared to last year, how often do you plan to binge drink this year?" Their reactions to the ads and to this loaded question may not transfer to other sub-populations in the USA or to students in the UK. Another limitation is that only the pilot study compared the ads to no ad at all; in all the others, students were allocated to see one or other of the two anti-alcohol ads. None of the studies tell us whether, compared to no ad at all, the ads led students to intend to drink excessively or actually do so. All we know is that in certain circumstances, seeing one ad was counterproductive vis-à-vis seeing the other; it may nevertheless have been better (or at least, no worse) than no health promotion at all. Also, both adverts look amateur and seem to give not very persuasively framed messages, the content of which may easily be discounted. Better expressed and produced ads may have lent themselves less easily to 'defensive processing', and produced a different reaction. However, the general ineffectiveness of anti-drinking advertising campaigns suggest that the featured studies' results are not merely due to context or ad quality. When experts assessed the full panoply of strategies to prevent or minimise alcohol-related harm, they could find no media campaign strategies to recommend: "Media campaigns prepared by government agencies and non-governmental organizations (NGOs) that address responsible drinking, the hazards of drink-driving and related topics are an ineffective antidote to the high-quality pro-drinking messages that appear much more frequently as paid advertisements in the mass media". In respect of illegal drugs too, in controlled studies anti-drug adverts have if anything bolstered intentions to use these substances.